Published: January 27, 2017 • Modified: October 29, 2018 • by Author: Analida • Word count:875 words. • About 5 minutes to read this article. 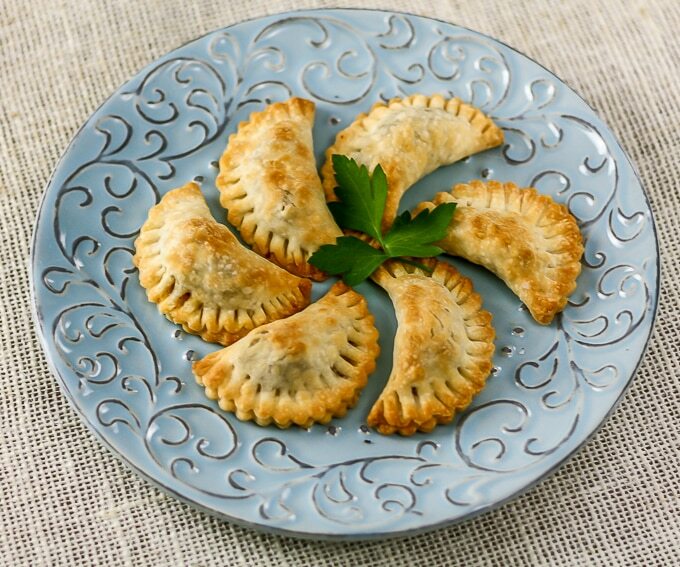 Empanadas are savory turnovers common throughout Latin America and the Caribbean. Every country has their own variation of seasonings and ingredients adapted of course to regional taste and culinary traditions. In Spanish, the word empanada literally means breaded. The Spanish word for bread is pan, hence empanada.
. They are round cutouts that come in two sizes. These work well: the only drawback is that they taste better fried! What doesn’t? For snack empanadas I use a pre-made pie crust, any brand works. Cut individual rounds with a 2″ biscuit cutter. Each pie crust round will yield approximately 12 mini empanadas. I like these because you can bake them, which is healthier than frying. Now, if you are good with pastries, by all means make your own dough. I use pie crust because it is quick and easy. The fillings for empanadas varies. The most common are beef and chicken. Cheese is also used, but it is not as popular. If you use cheese you need to use a cheese that doesn’t melt too much like a farmer’s cheese. 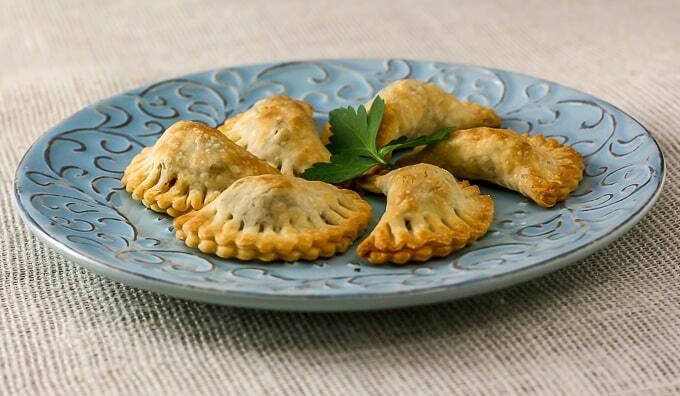 In coastal regions of Spain for example, it is common to see empanadas with a seafood filling. 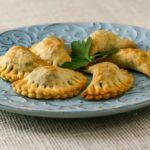 As an amateur food historian, I have done some research into the origins of empanadas and discovered that virtually every culture in the world has their own version. For example, in India samosas are the equivalent. These are either vegetarian or use meat (lamb or chicken). They are normally eaten with a yogurt sauce or a chutney. Other empanada-like treats are: jiozi from Japan, pasties from Wales and wontons from China. 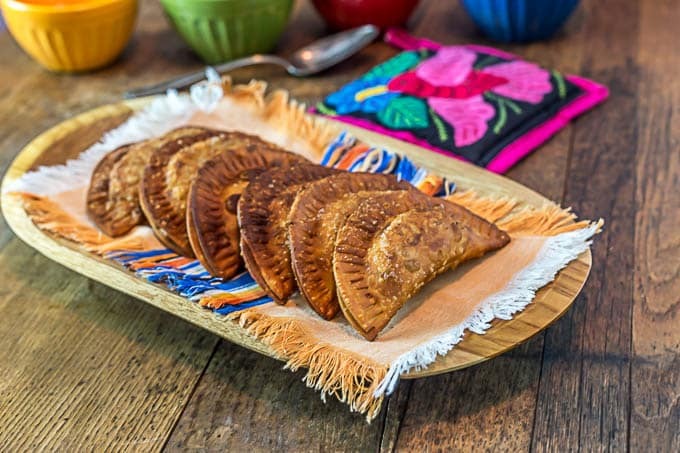 It is believed that the origins of empanadas can be traced to medieval Spain where they were introduced by the Moors who occupied the Iberian Peninsula between 711 AD and 1492 AD. The recipe calls for sofrito and recaito as seasonings. You can make your own or purchase it. If you want to fry them, cook all the meat filling and let it cool completely. The dough will go to mush if you don’t. They freeze very well. Keep in mind they need to thaw before frying. I usually serve the beef empanadas with a salad and dip them into a little ketchup. So good! I used to do this as a kid. Old habits die hard. If you want to get creative you can certainly put the meat filling into puff pastry and bake them according to the pastry instructions. Just be sure the meat is fully cooled off before working with the pastry. Working with the hot meat mixture turns any dough into mush. Another quick and easy baked recipe version, using a 15 oz. package of pie dough, is my avocado black bean and queso fresco empanadas pictured below. I like to brush these with a little egg wash for a nice shiny golden exterior. So for your next party take a batch of empanadas; they will be the hit of the party!! Share the recipe with your friends. 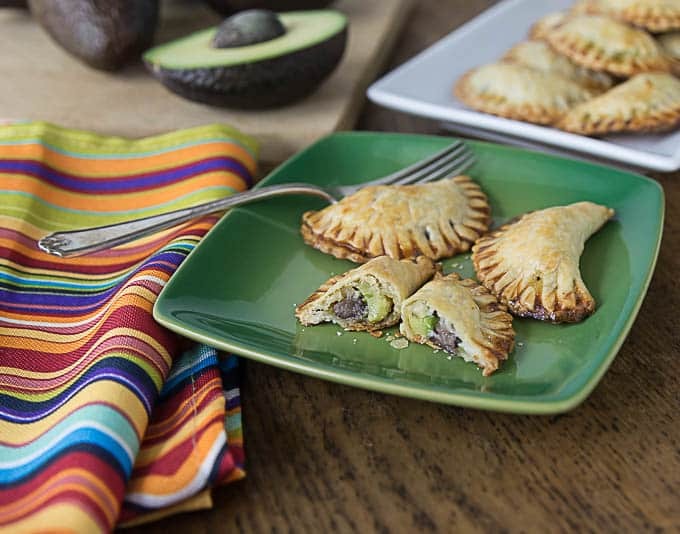 By the way, if you would like other empanada recipes, check out these recipes for black bean and plantain empanadas and avocado, black bean and queso fresco empanadas. Here are some great picks on Latin food recipes from Amazon too! Buen provecho! Empanadas are a Latin American favorite. 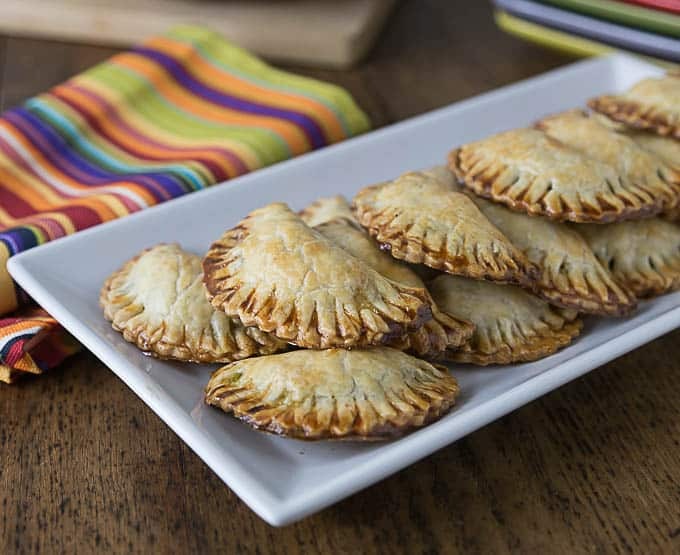 A party just isn't a party without a batch of these delicious savory beef turnover. You can make them ahead and freeze them too. In a skillet over medium heat saute onion, salt and garlic until translucent. Add the beef, and break up in small pieces. Add the rest of the ingredients. Stir until thoroughly cooked. Move to a small container and let cool for about 10 minutes. Unroll pie crusts. With a 2" biscuit cutter, cut circles all around pie crust going around the perimeter and then moving in to the inside of the circle. Take a round in the palm of your hand and place a small amount of meat in the center. Fold inwards to create a half moon shape. To completely seal, place on the counter, and using the tines of a fork press all around the edges. Continue until you have used all the meat. Place on ungreased baking sheet and lightly spray with PAM or any other non stick spray. Bake for about 15-20 minutes or until they turn slightly golden. Yields about 36-40 mini empanadas. ** Sofrito and recaito can be purchased in the grocery store in the Latin food section. You can also make your own with the recipes I have provided in this blog. These look great! My husband is from Puerto Rico and we LOVE empanadas! I love to party with you. I like the idea to use pie crust! I’m always using puff pastry with empanadas and it slightly annoys my Cuban husband. 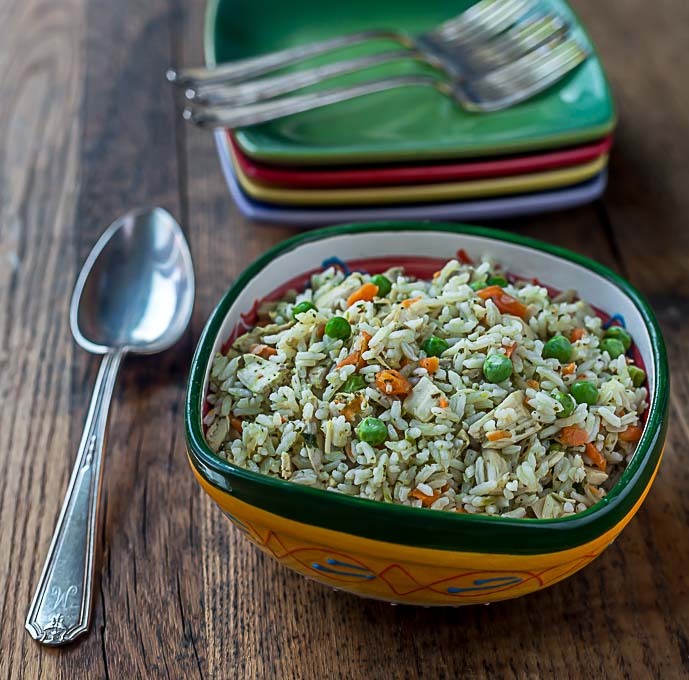 I bet he’d love this version – he is a huge sofrito fan. Visiting from Foodie FriDIY! LOL, I guess puff pastry doesn’t cut it for him, huh? Yes, the pie crust is great, and so easy too! Biscuit dough works great for me also!!!! Thanks Maria for your tip! I will have to give it a try. Sounds wonderful. That is so cool!!! My friends and I used to go to the Balboa bowling alley. Fun memories. Did you go to St. Mary’s?